Let the sunlight in with the warm and appealing design of the Hillsdale Scottsdale Coffee Table. 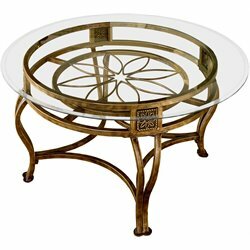 The Scottsdale Coffee Table is both attractive and efficient, with a delicate floral motif upon sturdy metal construction. This exquisite piece features graceful flowing lines and intricate castings with naturalistic flourishes that combine to bring you the summertime anytime.